Click on the thumbnail image for a larger view. Visit Hannah's Commissions page for more sculptures. Hannah has a strong interest in form and composition, and regularly marries the animate world with the inanimate. This is particularly apparent in her series of heads. Here she combines expressive human heads, with geometric or other simple forms to create a strong emotional whole. 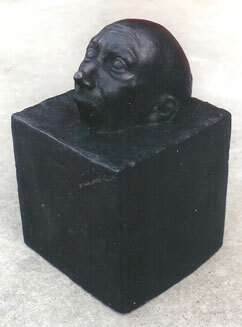 The interaction of the head with the rest of the sculpture may be aggressive, supportive, or protective. This dynamic that is formed is reflective of the many relationships we experience in life as individuals and collectively or as a country. Representing situations where we feel, for example, at peace, unable to cope or open. Most of these sculptures are limited editions and are available in Bronze or Plaster. Please contact Hannah for prices and details.